Notes: These critters are capable of injecting venom through a pair of claws beneath the head. They have one pair of legs per body segment (15 or more in an adult, but not 50) and can reach a foot in length in this area. They are carniverous, feeding on smaller invertebrates. 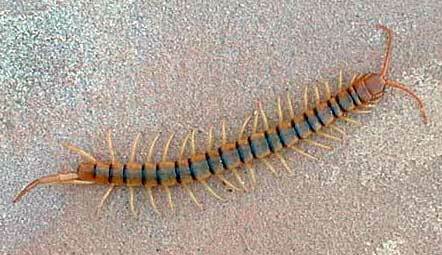 Non-venomous, herbivorous millipedes are smaller and generally have two pairs of legs per body segment.